"Icarus. The original myth had two parts. Daedalus said to his son, 'I fashioned these wings for you. Two rules. Don't fly too high, or the sun will melt the wax. But, more important, son, don't fly too low. Because if you fly too low, the water and the waves will surely weigh down the wings, and you will die.' We've left out the second part of the myth. We don't say to people anymore, 'Don't fly too low.' All we do from the time they are 4 years old is warn them against hubris. We have created this industrially led structure that says: How dare you." And then, three years ago, he dropped out of sight. "I made a decision to write for my readers, not to try to find more readers for my writing," he explains. "I don't do outbound stuff to interrupt strangers." Godin isn't as bald as he appears in pictures. The white duck down encircling his head is trimmed close. Sinewy and alert, he is also gracious and relaxed and makes a habit of preparing his favorite lunch of brown rice, vegetables and a fried egg for guests who visit the apartment he has transformed into a homey office in downtown Hastings-on-Hudson, N.Y.
With his new book, The Icarus Deception: How High Will You Fly?, Godin ends his self-imposed exile. Published by Penguin Group's Portfolio, the book was funded publicly via a Kickstarter campaign that raised $287,342 from 4,242 people in 30 days. "I am more proud of this than anything I've ever done," Godin says. "Icarus feels urgent enough that I wanted to reach a group of people I can't easily reach with a blog post. And I wanted to be able to talk to those people with authority, so that they open up and give it a try." Starting with this, his first-ever major magazine profile, Godin is aiming to connect with should-be, almost-are or want-to-be artists. They need to know, he proclaims, that this is their moment. "How many people get to go to work every day and say, 'This might not work,' and then go [do it]? The answer is, not enough," he says. "But it is going up. And that's what the book is trying to sell people. It is trying to sell them the joy of being able to say, 'This might not work.' Because it is so cheap to fail today compared to what it was to fail 50 years ago." Success, meanwhile, has never offered more rewards. "We are paying people more money and giving them more freedom than ever before to make art," he says. It isn't just painters and potters and poets. Entrepreneurs, marketers, crazy people who dance on street corners and anyone else who isn't afraid to express themselves has the opportunity to find an audience. 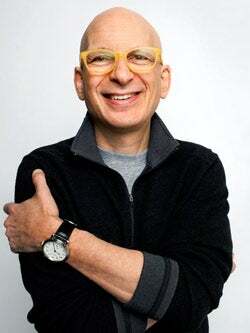 "The sooner you deal with this and embrace it, the more likely it is that you end up on the side of the chasm with the people who can't believe their good fortune, as opposed to people who are cursing the darkness," Godin says, delivering his heaven-or-hell scenario with equanimity. "I'm pretty sure I'm right. What I'm not sure of is how long it will take and how unevenly it will be distributed. "We've left the industrial era, the era of Mad Men, the era of 'Build a system, spend money and grow it,'" he goes on. "The recession is permanent. The cyclical one is over, but there is a permanent decline in industrial labor that is going to continue for the rest of our lives." What we have now, he maintains, is a "connection economy," in which impresarios are the new big men on campus. "We are in an era of handmade insights, of human beings who touch other human beings in some way, making change happen." As good as that sounds--and Godin assures it is good--such a change can be both disruptive and destructive. Expect collateral damage: Some people will not be able to make the shift from working for others to working for themselves. All this is detailed in Icarus, which Godin describes as a "screed." But though written in his discursive, stream-of-consciousness style, the book is neither long nor a rant. It is Godin's clarion call, a public appeal to seize this moment of opportunity and riches before the barriers are rebuilt. If enough people make enough good art, impresarios might rule the world--an idea Godin finds appealing. Walk into any bookstore and you will find titles promising to liberate you from ennui, a hundred fast rides to wealth and fame. The self-help guru of the moment is Tim Ferriss. His narcissist's guide to getting rich by working very little, The 4-Hour Workweek, covers all the bases. Godin's books take the opposite tack. Rather than "how to," they are "what is," capturing big-business trends in short, evocative phrases.Unleashing the Ideavirus (2001) is a strategy for inspiring change in society. Purple Cow (2003) discusses the power of being unique in a world of sameness. And Tribes (2008) explains the new ways we are organizing ourselves in a hyperconnected world. Whatever the particular market phenomenon he is describing, Godin's central message is the same: Face your fears. Risk failure. Struggle. Persevere. Be free. He offers no shortcuts or detailed directions. "Seth is one of the few people I know about whom I would be comfortable using the overused term guru," says Kevin Kelly, one of the visionaries behind Wired magazine and author of What Technology Wants. "Technically a guru is an enlightened teacher of wisdom, not a mere expert. 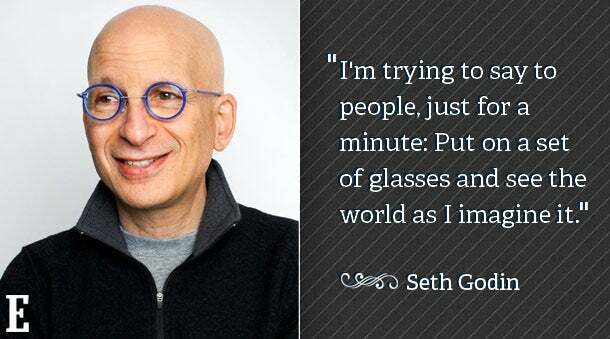 Seth is a legitimate guru. He dispenses wisdom and teaches wisdom. He is forever reminding everyone of the unchanging truths, and then overturning everything else, and constantly questioning his own--and your--discernment between the two." Michael Wayne was building his digital media company, DECA, when Godin released Tribes. "He captured what we were thinking and experiencing before anyone had a name for it. I bought the book for everyone in our office," Wayne says. Godin calls himself a teacher. He'd rather give his students a compass than a map. "I'm trying to say to people, just for a minute: Put on a set of glasses and see the world as I imagine it," he says. "Does it work for you? Does it feel right? Does it make sense? And, if it does, don't do what I just said to do--that's a cookie cutter. 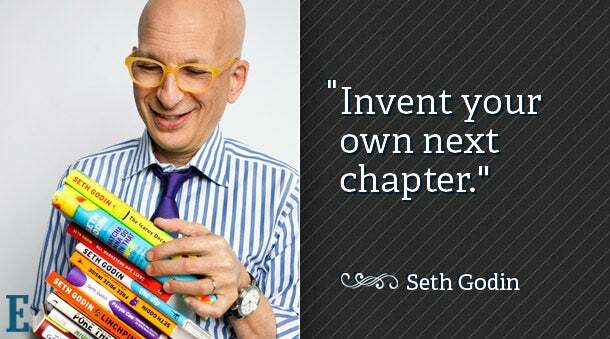 Invent your own next chapter. " The ubiquitous checklist of "foolproof" steps to solve problems is "an easy sell," Godin says, "but it isn't true." More important, "it isn't going to put a dent in the universe. 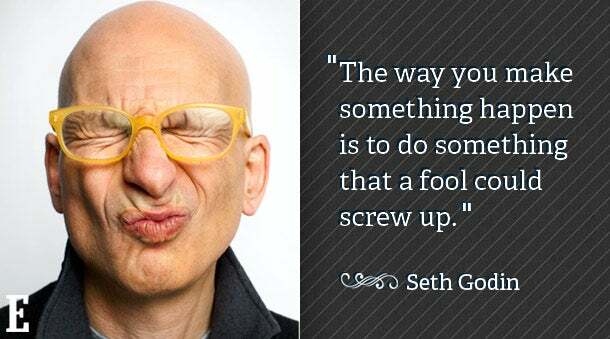 The way you make something happen is to do something that a fool could screw up. These things aren't foolproof. They are risky, scary. They require vulnerability and a willingness to be in the world." Buffalo, N.Y., in the 1960s was a painful obstacle course for a scrawny kid growing up with what he now thinks was attention-deficit disorder. Everyone played hockey, so Godin did too, despite heart-stopping fear of being slammed into the ice. And everyone went to summer camp, so Godin's parents sent him off to Camp Arowhon in northern Ontario. "I didn't like it much as a kid," he recalls. "Camp was about fitting in, and there was a fair amount of bullying." He stuck it out, though, finding his niche as a canoeing instructor. Godin's job wasn't just to teach canoe tricks--he had to convince campers to do that instead of horseback riding or swimming. "Canoeing was hard and scary, and the wind could blow you across the lake if you did it wrong," he says. "After a year of not doing it right, I could talk to people and get them to sit up straight, take different kinds of chances, to breathe differently, to engage in the moment in the boat. And I changed them, and I changed me in the process. I did it for five or six years. I was really good at it, and I really loved doing it, and I've been trying to re-create that ever since." After graduating from Stanford University's business school in 1984, Godin started a book-packaging company, peddling finished concepts to publishers. He had an early success, followed by 900 failures. Then, he says, he found his groove, before completely screwing up. "This T-shirt here is one of my most treasured possessions," he says, pulling out a garment featuring the cartoon face with round glasses that has since become his logo. "Forty billion dollars is what this T-shirt is worth." In the early 1990s, before the online world had fully formed, Godin snagged a magazine assignment to write about "cool things" happening on the internet. He parlayed that into an $80,000 book deal, Best of the Net. The T-shirt was part of the package. "I hired a lot of people," he says. "It took six months. We made a 250-page book, and it sold less than 2,000 copies." At the same time, "Jerry Yang and David Filo saw what was going on with the net and said the best way to tell people is to start a search engine. And they started Yahoo. "I knew what they knew," he continues. "I had the resources they had. And I created a book that sold nothing, and they created a company worth $80 billion. I figure I would have had half of that, so that is why the T-shirt is worth $40 billion." Yoyodyne was a scrappy little company that punched above its weight. When everyone else was treating internet users as a commodity, Godin preached relationships. 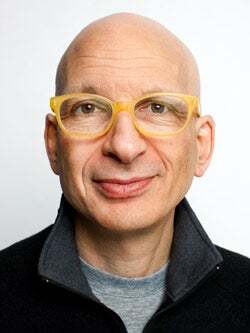 "Seth likes to say there are two ways to get married," says Michael Landau, a colleague at Yoyodyne who became vice president of brand marketing at Yahoo and is now CEO of Drybar, a chain of chic hair salons. "You can go up to every single girl you meet and hope that you get some random sucker who agrees to do it, which is what traditional advertising does, or you can take a more methodical approach: Ask someone out on a date first and get to know them. Then another date. And, eventually, get married." Yoyodyne, Landau adds, was an "intoxicating" experience. "The world was changing in a big way, and no one knew what to do. Desperate is probably the wrong word, but clients were anxious and grateful for someone helping them figure it out." Godin needed a way to explain exactly what he did for clients. "We weren't selling ads, so what were we selling?" he recalls thinking. "I got in the shower one morning and didn't get out until I had my answer. Just as the hot water ran out--15 to 20 minutes--I had it. What we do is 'permission marketing.' We deliver anticipated, personal and relevant messages to people who want to get them." He laid out the philosophy in Permission Marketing. "Seth has created his own school of marketing," contends popular Silicon Valley blogger Guy Kawasaki. "He doesn't fit into anyone else's. He's all about clear differentiation, permission and not asking customers to do something that you wouldn't do." Landau calls Godin a mentor who "truly changed the trajectory of my career and my life." That said, he adds, Godin "can be the most frustrating person because he really makes you think. He is never going to tell you what to do. He is never going to give you the answer. He is going to steer you in the direction to get there." At Drybar, Landau has been struggling to control costs, in particular the cost of taking phone reservations. He was thinking about offering $1 off to anyone who booked online, but Godin's advice changed his mind. "Double what you spend on telephone operators," he told Landau. "Encourage customers to call in--these people love connecting with your brand. They are your evangelists." Landau says those words "completely shifted" his thinking. Indeed, "Never squander your relationship with your customer" has been a Godinism for 20 years. A year after the Yahoo buyout, Godin left Silicon Valley to live a writer's life in the Hudson Valley, helping people improve their marketing skills. "What's really cool, which I didn't plan on, is that it applies to people way down the hierarchy of scale and profitability," he says. "It applies to second-grade teachers, a waitress in a restaurant who wants her tips to go up, or musicians or painters who want to make a living. And that's all new." Indicating a giant compilation of the best of his blog posts, a gift to the Kickstarter investors in the project, Godin says, "The name of the book is This Might Work, but if you turn it over, the back cover says This Might Not Work. And if you open it, you see a list of all of my projects that have been complete failures. You have to embrace the stuff that doesn't work or you don't get to play." But if you can accept that, and you offer your art to the world, Godin contends, life improves. New things are possible--witness the artisanal revolution that swept through the food world a couple of years ago. Mass-market producers like Procter & Gamble are losing more shelf space to impresarios every day. "If it isn't going to happen in your industry, then your industry is dead, and you should get out of it. It will downsize and cost-reduce, and you can't win there," Godin warns. "The connection economy creates abundance," he notes. However, "there are not going to be jobs like we used to think of jobs. Those jobs are going away. But the number of opportunities for tribe leaders goes up." This is because the connection machine and the marketing machine and the announcement machine that is the internet allows everyone to create. "I can't even go to the edges of how revolutionary this all is, because people can keep coming up with stuff that is even closer to the edge," he says. "The thought that there will be franchises where there is no franchisor isn't that big--it is only two years from now. The idea that if you can't get on TV, you will make your own show and broadcast it is happening right now. No matter what field you are in, your bluff is called. You can no longer point to boundaries that are there, because they are pretty easy to surmount, if you want to. "In 1918, the one thing you wanted to hear was 'Make sure you have an assembly line. Make sure you have mass production.' In 1950, the one thing you wanted to hear was 'Buy more ads.' [Now] the only thing you need to hear is 'Be more generous. Make more art so that you can be trusted.' If you try to maximize those things, everything else will take care of itself." Postscript: I approached the research and writing of this profile wearing two hats. I was both a journalist and an entrepreneur. My standard curiosity spiked with skepticism made room for a bit of optimism that perhaps I'd learn something that would help me build Zester Daily, the journalists' business cooperative I founded. I asked Godin about skills, talent and connections. "If I were talking to people who are diamond-cutters or cardiac surgeons, I think we can agree that skill first, second and third are all I care about," he said. "But almost everyone who is making progress in today's economy isn't doing something with a certified skill. So the skills we are talking about are the skills to connect with people, to see the world as it is, the ability to imagine a different place you would want to take the world. These are fundamental human skills, not something you learn at Harvard." I asked about money. "Anyone subscribing to this magazine has enough resources to put something into the world and see what happens. It has never been easier," he said. "We just connected you to a billion people for free. It costs you nothing to start that eBay business. If no one buys your stuff on eBay, then don't sell it. It costs you nothing to buy Google Ads. If no one clicks, you don't have to pay anything. It costs you nothing to have a blog and give away every secret you know. If no one reads it, nothing happens." The thought of failing makes me sad, I told him. "If Zester doesn't work, it will be because you have been protecting yourself from being sad," he said. "Art is painful. Bob Dylan got booed offstage when he went electric. He got booed offstage when he went gospel. The Monkees never got booed offstage." Then I asked about finding an audience. "Generally, the tribe finds you," he said. "If they are hiding, you are never going to find them. And if they find you, it is because you are being generous to others who are in your tribe. Generosity in the industrial setting means giving them stuff. But I'm talking about giving them kindness and attention and connection. "I thought what was neat about Zester," he added, "besides the writing being really good, is that the tribe of people who are going to spend the time reading is exactly who a certain group of people need to reach with their advertising. But they aren't going to do it willingly. They are only going to come along after you are so dominant in the space that they have no choice. The key is, if every one of your users gets you 10 more, and you do that three times, then you win."